GLBTQ Legal Advocates & Defenders (GLAD) joined with partner organization, National Center for Lesbian Rights, and others today in filing an amicus brief with the United States Supreme Court in the case Gloucester County School Board v. G.G, soundly rebutting the School Board’s argument that its discriminatory action barring Gavin Grimm from using the boys’ restroom at his high school is justified by privacy concerns. 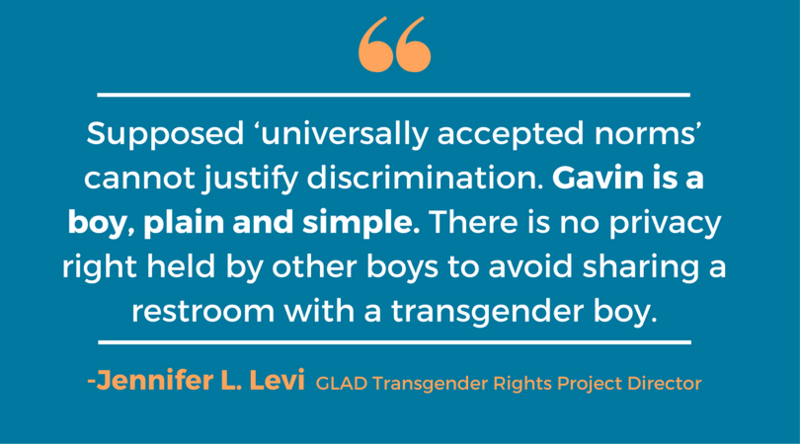 There is no privacy right of other boys that is violated when a transgender boy uses the boys’ student restroom. Nothing in Title IX’s language can be read to authorize an unwritten privacy exception that defeats a transgender boy’s equal access to all school facilities, including restrooms. The fact that schools that want to enhance students’ privacy in restrooms can easily do so demonstrates that the alternative measure adopted here – a Board policy excluding transgender students, and only transgender students, from using the shared facility – is unlawful discrimination. The brief, written by Levi, Shannon Minter of the National Center for Lesbian Rights (NCLR), and Dean Richlin, Amanda Hainsworth, Rachel Hutchinson, and Emily J. Nash of Foley Hoag, LLP, was submitted on behalf of GLAD, NCLR, the National Center for Transgender Equality, FORGE, Transgender Law & Policy Institute, and the Trans People of Color Coalition. Gavin Grimm is represented by the ACLU. The Court is set to hear oral argument in the case on March 28.